CarGurus has 35,624 nationwide Tahoe listings starting at $950. Three rows of seating, cavernous cargo capacity, hitch-free V8 performance, capable ride and handling characteristics, and admirable attention to detail have the 2012 Chevy Tahoe lineup riding high again. 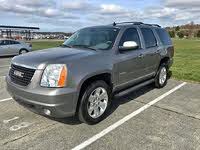 A less-than-comfortable, not to mention unwieldy, third-row seat, along with the lack of a telescoping steering wheel, tepid mileage figures with the conventional trims and a somewhat disappointing dashboard and control layout continue to haunt the big 2012 Tahoe SUV. The 2012 incarnation of Chevy’s Tahoe remains fit for hauling lots of people, cargo and trailer tonnage. It won’t, except in its Hybrid edition, help the fuel budget much, but it will, especially in its 4-wheel-drive configurations, get to that favorite fishing spot or up a snowy mountain road. If a large crossover just won’t cut it, then by all means give this king-size ute a try. Dedicated SUV-ers and those needing lots of passenger accommodations and cargo room ought to find the 2012 Tahoe to their liking. A dwindling demand for full-size, truck-like SUVs, however, keeps the folks at GM busy updating their 3 heaviest sport utes (Tahoe, Suburban and Yukon) to conform with modern demands for comfort, efficiency, utility, safety and performance. As a result, in a far cry from its burdensome beginnings, Chevy’s 7- to 9-passenger Tahoe, still in its third generation, boasts better fuel economy, a tolerably compliant ride, a less raucous cabin and even a few fairly athletic moves. Anyhow, Chevy’s hefty ute comes in 4 trim levels, the base LS, midlevel LT, high-end LTZ and the frugal Hybrid, in addition to Fleet trims. All trims sport 108.9 cubic feet of total cargo area, 3 rows of seating (with an accompanying plethora of configurations) and either conventional or hybrid V8 powerplants that each offer better-than-adequate towing capacities. Then there’s the veritable cornucopia of features and add-ons. Traditionally, this big ute is delivered in a rear-wheel drive (RWD) configuration, but all trims remain available with on-demand four-wheel drive (4WD). As seems traditional, a notable downside to the Tahoe’s ilk includes a frustratingly cramped and unwieldy third-row seat that must be removed to take real advantage of its sizeable cargo area. Also, according to a number of reviews, both professional and consumer, this king-size ute starts out pricy and with add-ons can get into astronomical figures. Finally, conventionally powered Tahoes, though better than before, aren’t exactly the most fuel-efficient vehicles out there. Many feel, therefore, that it may not be the most value-laden full-size ute on the market. 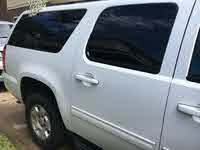 On the plus side, according to most reviews, the Tahoe Hybrid offers clss-leading fuel efficiency. Toyota’s imposing Sequoia represents the Tahoe’s most direct competition, but Ford’s well-wrought Expedition, as well as GM’s own GMC Yukon also line up against Chevy’s full-size ute. Those who expect to tote more passengers than payload, however, might be well-advised to look into a large crossover, like the Chevy Traverse or the Ford Flex, leaving the less fuel efficient and more agility-challenged Tahoe and its ilk to the classically demanding towing and hauling duties. A full-sized sport ute like the 2012 Tahoe obviously demands some hefty power output, thus its standard E85 ethanol-capable (FFV) 5.3-liter V8 engine and 6-speed shiftable automatic transmission. This potent drivetrain throws down 320 hp at 5,400 rpm and 335 lb-ft of torque at 4,000 rpm, good enough for this beefy brute to tow some 5,500 pounds of trailer with the standard hitch or 8,500 pounds with the available heavy-duty towing package. Variable valve timing (VVT), along with cylinder de-activation at highway speeds, keeps estimated mileage at a tepid 15 mpg city/21 highway in both RWD and 4WD trim variations. The available on-demand 4WD system, meanwhile, touts electronic hi-lo gear selection and auto-locking hubs, with owners offered a choice of a single-speed (no low-range gear) or a 2-speed transfer case in LS and LT trims. The LTZ, as befits its elevated status, is delivered only with the 2-speed version. In any case this likeable system sends power to all 4 wheels all the time, with the low-range gearing in the 2-speed transfer case allowing a sizable increase in torque when the going gets especially tough. Be advised, by the way, that neither system is designed for dedicated rock climbing. The Tahoe Hybrid is delivered with a 6.0-liter VVT hybrid V8 engine and 2-mode electric powertrain system. All this is managed by a unique 4-speed automatic transmission that interfaces with the gasoline V8 and the pair of 60-kilowatt electric motors to adapt seamlessly from all-gas to part-gas/part-electric power, depending on conditions. Putting out a combined 379 hp, the hybrid powerplant uses the gasoline-burning V8 to crank out 332 hp at 5,100 rpm and 367 lb-ft of torque at 4,100 rpm with the regenerative braking system throwing in a big assist in keeping the electric motors charged. When this miserly Hybrid is kept under 30 mph—in city traffic, for example—electric power alone can carry the load for short distances. When properly equipped, the Tahoe Hybrid can tow up to 6,200 pounds with RWD and up to 5,900 pounds with 4WD. Meantime, gas mileage is an impressive 20/23 in both RWD and 4WD trims, while the Hybrid’s available 4WD system is offered only with the 2-speed transfer case. Reviewers find the conventional V8 powerplant to be more than adequate in powering the Tahoe’s hefty bulk, with a RWD trim tested from 0-60 in 8.5 seconds, about average for the breed. The 6-speed shiftable automatic performs flawlessly at any speed, while this peppy drivetrain loses next to nothing, performance-wise, burning E85 ethanol fuel. All in all, reviewers note the conventional V8 to be a standard for performance and refinement. The Hybrid trim, meantime, performs, according to reviews, much like its gas-powered siblings. Tests have a RWD Tahoe Hybrid scooting from 0-60 in 8.2 seconds, which isn’t bad at all for a battery-laden full-size sport ute. About the only difference between the fully gas-powered trims and their Hybrid kinfolk that’s worth reviewer comment is a slight surge that’s felt and heard when the Hybrid shifts from electric to gas operation. Chevy’s king-sized ute, although sitting on a truck-based frame, still boasts a reasonably compliant ride, according to most reviews. With the standard 17-inch alloy wheels found standard on the LS and LT, reviewers note that bumps and dips are well damped, while the 18- and 20-inch wheels that are standard aboard the Hybrid and LTZ respectively remain a bit less forgiving. All 2012 Tahoe trims are equipped with an independent front suspension, bolstered by a short and long arm front setup, multi-link rear end and stabilizer bars fore and aft. Alas, nearly all reviewers find that, without a hefty payload aboard or a sizeable trailer behind, drivers can expect a bit of float over peaks and valleys on the highway. Alas the LTZ, boasting the variable-shock-damping and load-leveling Autoride system as standard equipment, manages only marginal improvement in overall ride comfort, according to a number of reviews. Steering is noted by a majority of reviews to be tolerably alert for such a ponderous vehicle, with little appreciable body lean in corners, while a relatively tight turning radius means that parking and maneuvering in traffic offer less of a challenge than might be expected. Virtually all reviewers agree, however, that the Tahoe, designed as it is for towing and hauling, offers little in the way of pure driving excitement. Finally, brakes on this hefty SUV feel reasonably strong and true to most reviewers, with one test finding the Tahoe coming to a stop from 60 mph in 132 feet, noted as about the norm in these heavy haulers. A few reviews do, however, mention some issues with pedal modulation. Though not quite so well-endowed as its Yukon or Escalade cousins, the 2012 Tahoe still offers more than the usual complement of creature comforts and conveniences. The base LS, for instance, comes with a roof rack, as well as a trailer hitch and wiring, step running boards and heated power-adjustable outside mirrors. Inside, expect premium cloth upholstery, standard front bucket seats with a 6-way power-adjustable driver’s seat, remote power door locks and power windows, as well as cruise control and tilt-wheel steering. Dual-zone air conditioning complements simulated alloy cabin accents and a leather-wrapped steering wheel, with OnStar voice directions and hands-free calling provided free for 6 months. Finally, entertainment is provided via a single-CD player with 6 speakers, separate rear audio, satellite radio and a USB port, with Bluetooth technology bolstering hands-free communications. The LT and Hybrid trims add heated 6-way power-adjustable front seats, leather upholstery, power-adjustable pedals, rear parking sensors and tri-zone climate control, not to mention upgraded cabin trim accents and floor mats in front and rear. Additionally, these midlevel trims boast 9 Bose premium speakers, including a subwoofer. In keeping with its princely status, the Tahoe LTZ boasts a rear power liftgate, heated steering wheel, premium leather upholstery, reclining second-row captain’s chairs, reverse-tilt mirrors, a universal remote garage door opener and a rear-view camera. Cabin trim is further upgraded with simulated wood and simulated alloy accents in this flagship trim, with an extra speaker added as well. Finally, the LTZ sports standard hard-drive-based navigation with dash-mounted display and real-time traffic. Both the rear-view camera and the navigation suite are each standard aboard the Hybrid, which also sports a unique dashboard-mounted power-flow display. 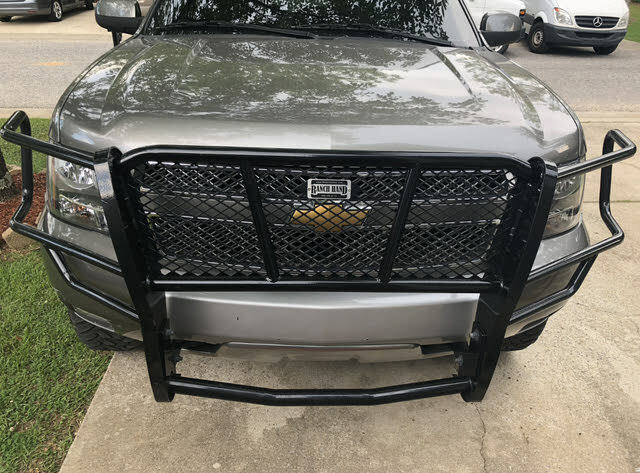 The base LS offers the available Convenience Package and/or the Texas and All Star packages, which sport many items that come standard with higher trims. Additionally, the LS remains the single trim available with front bench seating for 9-passenger capacity. All non-Hybrid trims, meanwhile, are eligible for an available heavy-duty trailer-towing package, as well as remote engine start that can be part of a package or added as a standalone option. The Z71 Off-Road package, with specially tuned shocks and springs, all-terrain tires, skid plates and unique front and rear fascias can be delivered in the LT and LTZ packages, as can upsized and upgraded wheels. Finally, the Sun, Entertainment and Destination package is available to the LT, Hybrid and LTZ trims, and boasts a power sunroof and rear-seat DVD entertainment, both of which are additionally available as standalone options. Reviewers are impressed with the Tahoe’s cabin room and overall ambiance, as well as many (but not all) comfort and convenience features found aboard. Generous head- and legroom in the first and second rows is, unfortunately, somewhat compromised by the cramped third-row bench seat. The 108 cubic feet of cargo room is generous, but cannot be fully utilized unless the third-row seats, which don’t fold quite flat, are removed, a frustrating and muscle-straining endeavor. Additionally, this big ute’s ride height can, according to many reviewers, result in awkward entry and exit, despite standard step running boards. Finally, the rear-view camera that’s standard in the Hybrid and LTZ is found by a majority of reviewers to be a useful item, but a distorted display renders it less than practical. Of course, its hearty size keeps the 2012 Tahoe out of harm’s way in the majority of driving conditions, but this family-oriented sport ute nonetheless carries standard 4-wheel antilock brakes with electronic brakeforce distribution, as well as traction and stability control. Dual front side-mounted airbags, meantime, are complemented by 3-row head curtain airbags, while daytime running lights and dusk-sensing headlights are standard across the lineup. All trims additionally boast a standard post-collision safety system, remote antitheft alarm and OnStar emergency services, including emergency communications and stolen vehicle tracking. Additionally, the LT and higher trims toss in standard front-fog/driving lights, with the Hybrid and the flagship LTZ sporting standard turn-signal-integrated mirrors. Finally, the LTZ is delivered with a standard blind-spot warning system. The National Highway Transportation Safety Administration (NHTSA) gives the Tahoe lineup its second-best 4 stars for overall safety. A third-best 3 stars for rollover protection is offset by the Administration’s best 5-star rating for front and side impact worthiness. 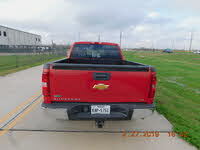 Curiously, Chevy’s full-size sport ute remains untested by the Insurance Institute for Highway Safety (IIHS) for 2012. The major complaint folks have with the 2012 Chevy Tahoe is that pesky third-row seat. Owners gripe that it doesn’t fold flat enough to take full advantage of the cavernous cargo area, it can be a major pain to remove and to reinstall, and it remains far too cramped for the comfort of average-size adults. Additionally, some rattles and a less than silky ride, especially on the larger tires, leave a number of owners a bit disappointed, as does the plethora of hard plastic cabin surfaces. Finally, as far as driving comfort is concerned, more owners would rather the presently unavailable telescoping steering wheel than the power-adjustable pedals that come standard with the Hybrid and LTZ trims. On the plus side, owners willing to pay the hefty MSRP for the Tahoe Hybrid enjoy its midsize-sedan-like gas mileage, while virtually all owners are impressed by this big ute’s styling, cabin room and cornucopia of creature comforts, whether in conventional or Hybrid form. Ride comfort is a pleasant surprise for a number of owners, while adequate handling characteristics, 4WD utility and the conventional Tahoe’s hefty towing capabilities round out the more notable advantages that owners appreciate in this well-wrought SUV. What's your take on the 2012 Chevrolet Tahoe? 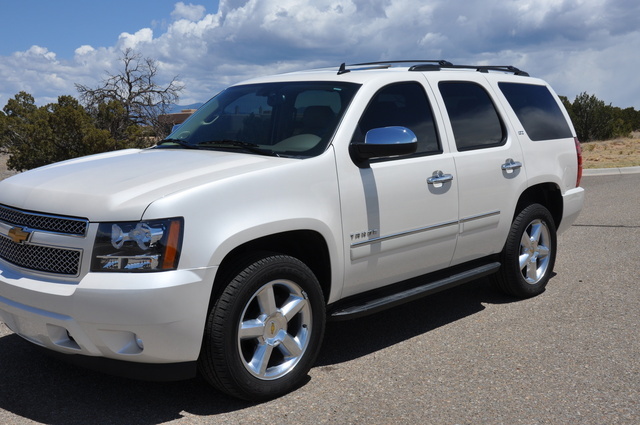 Have you driven a 2012 Chevrolet Tahoe? rear hatch will not open . only option to open is the button on the outside of the hatch. remote button is set to open the rear window . it is working fine. 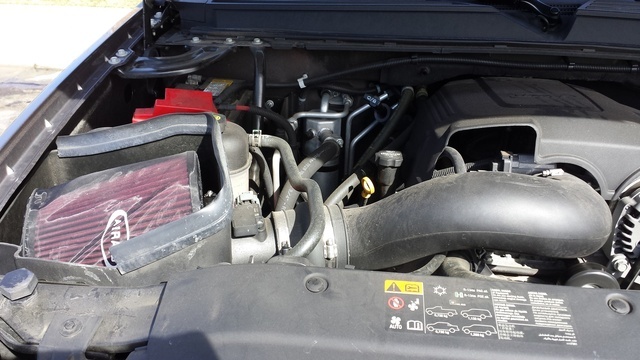 2012 Tahoe 5.3, Rough Idle.